Its getting very cold outside and Niagara winemakers are preparing for the Icewine harvest. Icewine is one of the world’s greatest sweet wines and can be the ultimate addition to your holiday party this year. 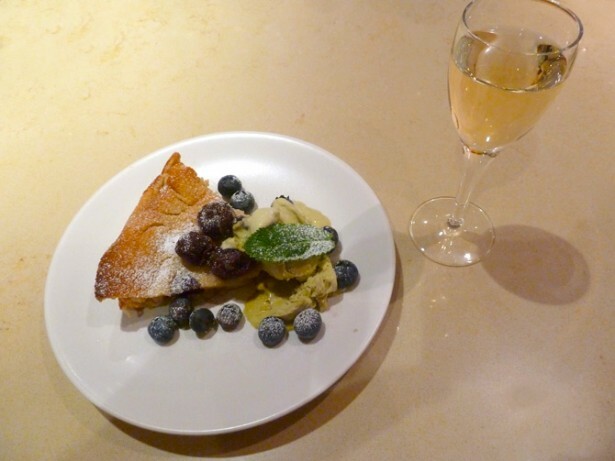 Icewine can be paired with many desserts or enjoyed on its own. Try it this season with some homemade apple based pastry or drizzled on top of some vanilla ice cream. Created by accident in Germany in 1794 Icewine or Eiswein (in German) began to appear on the international markets in the 1960s. By the 1980s Eiswein had made a global name for itself, competing with a number of other German sweet wines in quality and price. Although Germany has a long history of freezing grapes on the vine, in Canada Icewine is a fairly new tradition with only thirty years of production. The pioneers of Canadian Icewine are Inniskillin Winery, who made their first commercial harvest of “liquid gold” in 1984. After winning many international awards and accolades, Canada slowly began to put its name on the map in terms of dessert wine production. Canada’s Icewine industry produced close to 800,000 bottles of Icewine last year averaging $50 a bottle. 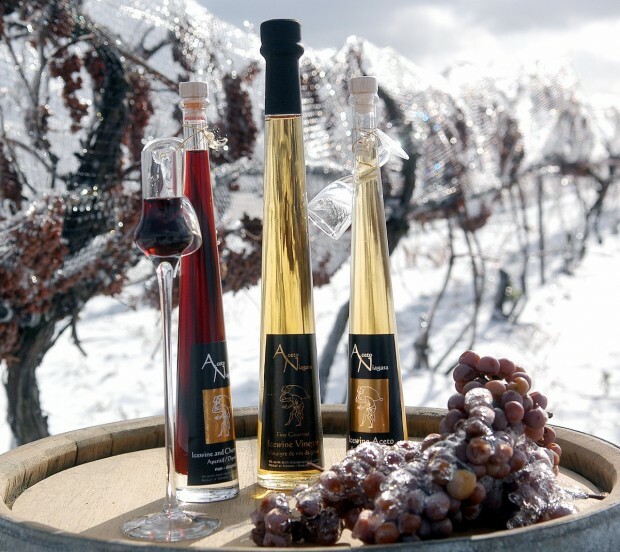 To assure quality, Icewine production is legally governed by the Vintners Quality Alliance of Ontario, and there are strict rules winemakers must adhere to before they can label their wine “Icewine”. Firstly and most importantly, like Eiswein, the grapes must be picked when the temperature is between -8ºC and -12ºC so they become sufficiently frozen. The grapes must also come from a single grape variety, and must be picked and pressed in a recognized grape growing area. The Niagara peninsula is the ideal landscape for quality Icewine production. Located inland on the North 43rd parallel, Niagara experiences a moderate continental climate with cold winters that allow winemakers to produce Icewine every year. Two major geological factors contribute to these ideal Icewine conditions, Lake Ontario and the Beamsville Bench. Lake Ontario is one of the largest bodies of water in the world and it is very deep meaning it will not freeze in the winter and never get too hot in the summer. The temperatures coming off the lake moderate the temperatures along its coastlines, including much of Niagara’s wine country. The Beamsville Bench is also very important because it act as a barrier for warm and cooling winds off the lake so that they recirculate back onto the vineyards. Last but not least, the final important aspect of Niagara’s terroir is its mineral-rich soil sitting upon limestone foundations. Riesling grapes are an ideal choice for this climate and style of wine for a number of reasons. Firstly, it thrives in cool to moderate climates like Niagara. It also ripens late, which is important if you want to pick grapes at full ripeness levels in the dead of winter. It is also a hardy grape variety that is resistant to harsh weather conditions which is the reason it is used in so many of the worlds late harvest wines that can experience rather harsh rain and hail, particularly going into the winter months. The natural high acidity found in Riesling grapes is ideal for balancing the residual sweetness found in Icewines and the typically green apple and fresh grape flavors make for interesting candied fruit flavors when concentrated through the Icewine process. 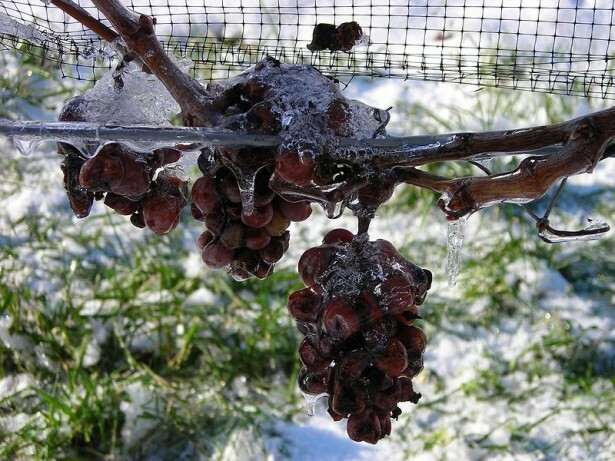 To make Icewine, grapes must become frozen on the vine. There are many grape-growing practices necessary in ensuring that Niagara Ice-winemakers have a healthy yield year after year. Many of these practices involve protecting the vines from the dangers of cold weather and vineyard pests. When grapes are left on the vine for longer than normal the number potential hazards increases significantly. Hazards include bad weather, insect or animal hazards, and disease. To prevent animals and insect from eating the late harvest grapes, grape farmers will cover the vines with plastic sheets. In the winter, after the harvest, grape growers will cover the base of the vines with dirt to protect them from winter freeze during the harsh months after December. Some wineries will use mechanical harvesting but most will use manual harvesting. Once grapes are picked they must be pressed and crushed almost immediately to ensure they don’t begin to thaw out, thus diluting the juice. When the grapes are pressed while they are frozen, the water inside has been crystalized and is removed from the must, leaving only very concentrated juices behind. One ton of Icewine grapes will produce 1/6th of the juice a table wine could. Most Icewine will be created with significant residual sugar left behind (Minimum 125g/L), leaving low alcohol (8-11.5%). The best Icewine vintages can be matured for long periods of time before bottling, however the majority will be aged for a year.